There have been many news accounts the past few days with Tibetans protesting the Olympic Torch relay in cities around the world. You can see pictures from the New York Times here. 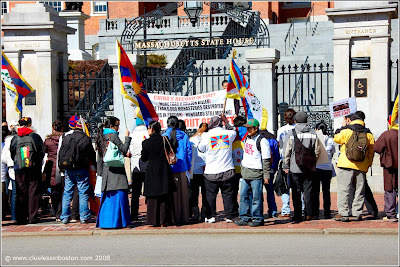 In honor of the Tibetans struggling for their freedom, I thought I would post another picture I took last month of a demonstration at the State House on the anniversary of the Tibetan uprising against China. See my previous post. Good for you! And great photo too. Demonstrations and protests always provide interesting material. CNN and western media are distorting the news. Without knowing the truth in Tibet, what are you supporting??!! Before 1951, Tibetan were slavers under control of Dalai. Is the "slaver" society what the protests want back? Shame on the protests, and shame on people supporting them without any background of Tibet and China.